The general outlook has worsened now that GDP forecasts have been revised downwards in the wake of the Brexit referendum and subdued global demand. Atradius forecasts 0% overall improvements in insolvencies in advanced markest in both 2016 and 2017, the weakest performance since 2009. According to the Atradius insolvency forecast model, little to no improvement is expected in business insolvencies in the majority of advanced markets this year. The overall outlook for insolvencies has worsened through 2016 in line with downward revisions to GDP forecasts. Brexit is likely to weigh on confidence in many advanced markets and has created financial market volatility. Global demand is expected to remain subdued, as low commodity prices negatively affect economic growth in emerging markets. In 2017 insolvencies are also anticipated to show little or no improvement, which fits into the picture of a weakening business cycle. Figure 2 and 3 summarize the results by giving the percentage change in insolvencies forecast per country for both this year and the next. Commodity-rich countries like Australia and Norway will continue to face headwinds in 2016 and 2017 following the decline in commodity prices. 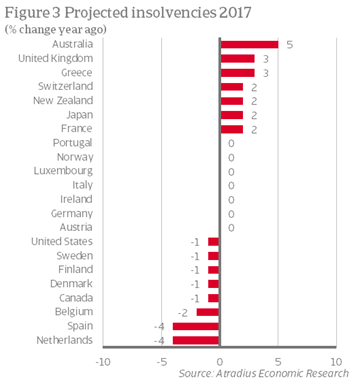 While both countries are making an effort to diversify their economies, and are aided by depreciating currencies and loosening monetary policies, bankruptcies for 2016 are forecast to increase by 8% in Australia and 2% in Norway. The United States is projected to see a 3% rise in insolvencies in 2016, which is a disruption of the downward trend visible since 2011. Firms in the energy sector are driving up aggregate insolvencies and weighing on overall corporate profits. The Federal Reserve’s tightening cycle could also make the business environment more challenging by making commercial loans more expensive. Eurozone countries are forecast to see very modest improvements in their business environments in 2016, while most countries are still facing high annual levels of corporate bankruptcies compared to 2007. 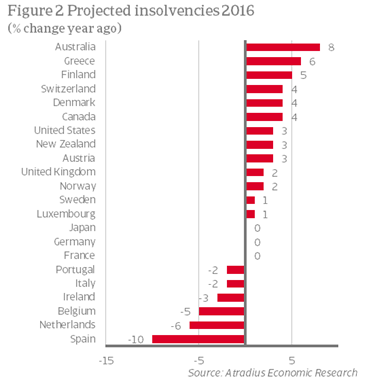 Portugal and Italy are expected to see a 2% decline in insolvencies this year. However, this slight improvement is from levels more than twice (Italy) or even four times (Portugal) as high as before the crisis. Vulnerabilities to external developments will put the brakes on improvements in 2017 in both economies, while systemic banking sector problems may even reverse the trend. Spain, on the other hand, followed by the Netherlands is the best performer of the eurozone facing a 10% fall in bankruptcies in 2016 (6% decline in the Netherlands) and both countries can expect a further decline in 2017. Spain is showing robust growth, though the economy is recovering from a very low level. Business credit conditions are improving and the drag on domestic demand from deleveraging is expected to fade out. Netherlands has faced economic difficulty as well in the wake of the 2009 recession, but is going through a period of catch-up growth mainly driven by higher domestic demand. Another front runner is Ireland, which has seen a strong improvement in insolvencies in earlier years, but this is expected to face stagnation in 2017. Bucking the trend is Greece, which is expected to face a 6% increase in business failures in 2016 followed by a further moderate rise next year. While Greece’s economic growth forecasts are slowly improving, the economy is recovering from a very low level and the business environment remains restricted by capital controls, proving a difficult operating environment for small- and medium- sized enterprises in particular. The insolvency rate for 2016 is still a factor five of what it was in 2007. The decision of the UK to leave the European Union has sparked a downward revision of GDP forecasts, which has led to a worsening of bankruptcy projections in a number of advanced markets. Insolvencies in the UK are projected to rise by 2% in 2016 and by 3% in 2017. Brexit is already weighing on confidence. UK’s PMI crashed into contraction zone in July, falling to a level of 47.7 compared to 52.4 in June, the lowest since April 2009. It seems likely that Brexit will also impact confidence in many other eurozone countries, particularly those with high exposure to the UK. 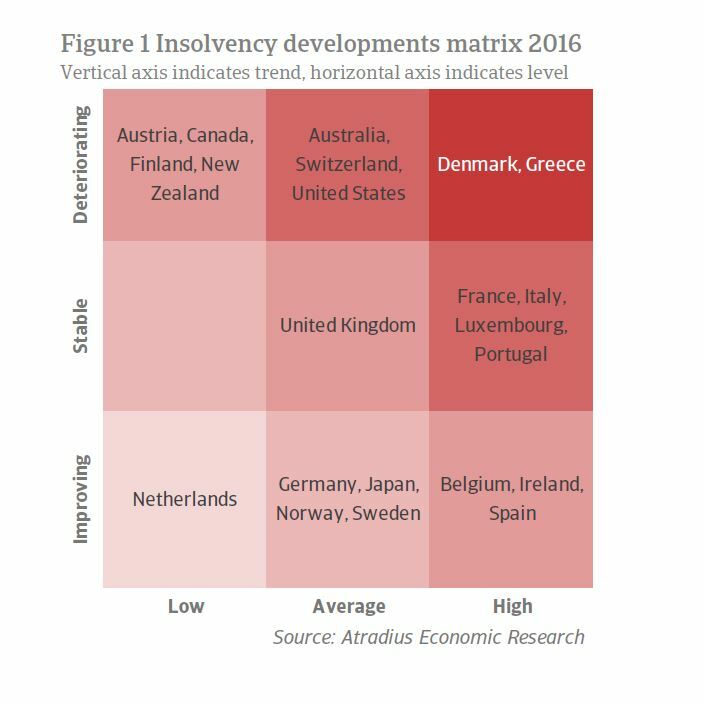 This is part of the reason why insolvency forecasts for Ireland and Netherlands have been revised upwards. The Brexit fallout is likely to extend to other European countries as well, like Sweden, Finland and Denmark. These countries will be struggling indirectly with the economic slowdowns and loss of demand in other European markets. For further analysis of the potential implications of Brexit on the insolvency outlook in Europe, check out Atradius' latest Brexit update here.